A red-haired female who has appeared in every Fire Emblem game, bar Gaiden, and is essentially the mascot of the series. In general, Anna never appears as a unit and only appears when you suspend the game or visit a Secret Shop. 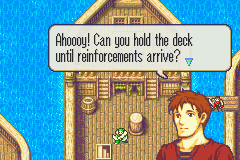 In the GBA games, she also appears in the Link Arena and during the prompt before you delete all data. In Path of Radiance and Radiant Dawn, she hosts the in-game tutorial and gives the player a lot of friendly advice. 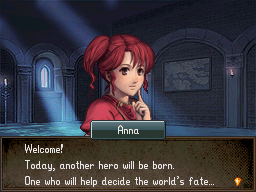 Anna briefly has dialogue in Dark Dragon and Sword of Light, Genealogy of the Holy War, Blazing Sword and Shadow Dragon. In each of these games, she appears to have a close relationship with another recurring character, Jake. She also appears before your Avatar in Heroes of Light and Shadow: the first time to confirm his/her details and the second time to inform him/her about the How’s Everyone feature. Awakening also reveals that there are many different versions of Annas, who Anna (the playable one) claims are her sisters. There are several Annas working as traveling merchants (who can be summoned using Rift Doors…), one who runs the Outrealm Gate—a door to other dimensions—and one of the DLC episodes even requires you to protect five Annas at once. Not to mention, in the DLC episode “The Strongest One’s Name”, another Anna is the “ultimate boss”. 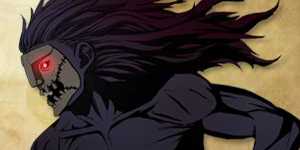 A male who has a close relationship with Anna; he varies in appearance, but usually has dark hair. Jake first appeared in the very first game, Dark Dragon and Sword of Light, as a playable Shooter (Ballistician). However, in the Mystery of the Emblem remake, he was removed (along with some other characters). His next appearance was in Genealogy of the Holy War, where he appears in front of Amid or Linda at the source of the Thracian River. Afterwards Jake appeared again in Blazing Sword, where he is a member of Fargus’s pirate crew. He pops up to greet the ship’s passengers if somebody visited Anna at the inn in the Port of Badon chapter. Recently, he is a playable character again in Shadow Dragon and Heroes of Light and Shadow. As a character, Jake is cheery and friendly, cares a lot about Anna, but seems to lack common sense. He attempts to adveritse Anna’s Secret Shop to both Marth and your Avatar, with mixed results. 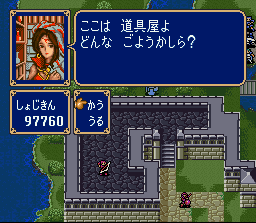 Larabel, known as Aimee in the English versions (except for in the North American version of Shadow Dragon), is the owner of the Vendor in Dark Dragon and Sword of Light, Mystery of the Emblem (although her name is not stated here) and the remakes. She also appeared in Path of Radiance and Radiant Dawn, as a member of the merchant convoy and once again serves as the Vendor. Story-wise, she has an unhealthy crush on the leader of the Greil’s Mercenaries, Ike. In Heroes of Light and Shadow, she’s briefly mentioned in a base conversation involving Samson and your Avatar. A race that has appeared in most of the games. Dragons usually assume human form, by sealing their powers within dragonstones, and are then known as Manaketes (Mamkutes in the Japanese version). In Dark Dragon and Sword of Light, Mystery of the Emblem and the remakes, the dragon tribe became Manaketes after a mysterious decline, thought to be the work of the gods. Those who refused to change ended up losing their minds and becoming feral. Thousands of years ago, the entire Earth Dragon tribe went feral and almost wiped out humanity, were it not for the Divine Dragon King, Naga’s intervention. Shadow Dragon Medeus was the one of the only Earth Dragons who became a Manakete and his sanity allowed him to forge the Dolhrian Empire. In Sword of Seals and Blazing Sword, there was a savage war between man and dragon, known as the Scouring. In the end, the dragons were forced to become Manaketes after the power of the Divine weapons altered nature. 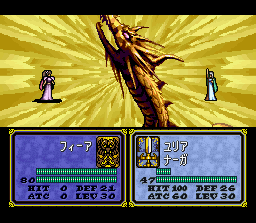 In their weakened form, the dragons were eventually defeated and forced out of Elibe. Some fled through a gate to another world; the Divine Dragons, meanwhile, found refuge in the desert utopia of Arcadia. In The Sacred Stones, the Great Dragon, who helped humans defeat the Demon King, was a Manakete. In Genealogy of the Holy War and Thracia 776, the dragon tribe do not appear physically (unless you count the final boss), but they are mentioned as the gods who descended at Darna to create the Twelve Crusaders. In Genealogy of the Holy War‘s Epilogue, Levin is revealed to have been possessed by Holsety—a member of the dragon tribe. Similarly, Evayle’s ending in Thracia 776 implied that she was also possessed, although her case appears to be different. The designer’s notes for Genealogy of the Holy War indicate that the dragon tribe hail from Archanea. In Path of Radiance and Radiant Dawn, a different dragon tribe (known as the “scaly dragon tribe” in the Japanese versions) feature. They are part of the greater Laguz race and do not require dragonstones to transform, but can instead transform at will (provided they have enough power to do so). Curiously, the White Dragon Laguz bear a resemblance to the Divine Dragons in Shadow Dragon and Heroes of Light and Shadow. The original dragon tribe reappears in Awakening and two dragons—Naga and Grima—form part of the backbone of the story. In particular, Grima’s skeleton literally stretches across most of Plegia, with Plegia Castle built on top of Grima’s skull. Otherwise, the citizens of Ylisse and Plegia worship Naga and Grima respectively (although Ylisseans refers to Grima as the Fell Dragon, Plegians call it a Divine Dragon like Naga). In this era, it seems few Manakete exist, although one of them, Tiki is well known and revered on the Valmese continent. Furthermore, Awakening introduces the Taguel race, which is strongly hinted to be descended from the Laguz and is conceptually similar to the Manakete—its a near extinct tribe that uses stones to transform into beasts or birds. By extension, it’s possible that the Manaketes are descended from the dragon Laguz. Throughout the series, the dragon tribe transform into various forms when they use their dragonstones. These include: Fire Dragon, Ice Dragon, Wyvern, Mage Dragon, Earth Dragon, Divine Dragon and Shadow Dragon. In Mystery of the Emblem, there is also an unused Sea Dragon. The dragon tribe in Path of Radiance and Radiant Dawn can transform into Red Dragon, White Dragon or Black Dragon. An entity that has appeared in many games, usually related to nature or magic of nature. In Genealogy of the Holy War, spirits appear indirectly in the form of the Spirit Forest, a forest said to be home to spirits. In Blazing Sword the rings, such as Ninis’s Grace and Filla’s Might, are blessed by the spirits of Fire, Ice, Thunder and Wind. Also, the blade Mani Katti is said to blessed by spirits and is referred to as the “sword of spirits”. In Path of Radiance, spirits appear in the form of the item, Spirit Powder, and spirit-charmers. Spirit-charmers are those who let spirits inside themselves to enhance their magical power, with the spirit slowly consuming their soul in the process. In Radiant Dawn spirits finally make a physical appearance. These spirits are split into Fire, Thunder and Wind variants, and attack with Fire Tail, Thunder Tail and Wind Tail respectively. A mysterious quality possessed by people, which is related to their life force and relevance to destiny. Aegir is mentioned in Genealogy of the Holy by Claude, who states that the Valkilli staff can only resurrect those who have substantial Aegir. Aegir is a key element in Blazing Sword, where it is known as Quintessence in the English version, as Nergal, the Dark Druid, strives to obtain Aegir to dominate the world. On numerous occasions, people who died are brought back to life, but they aren’t the same person they used to be and are instead nothing but a mindless zombie. 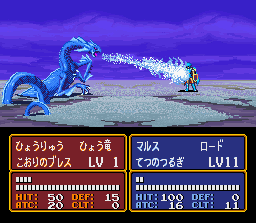 In Gaiden and The Sacred Stones (and Awakening, but I’ll get to that later) there are Revenant and Entombed (Zombie and Mummy in the Japanese version) enemies, but that’s not quite what I’m referring to. This theme probably begins in Genealogy of the Holy War and Thracia 776, where its suggested the 12 Dark Warlords were created from the bodies of fallen warriors. In particular, the warlords in Thracia 776 are modelled after and have the same faces as Leidrick and other playable characters who have died; their portraits have a pale complexion compared to the originals. In an interview about Genealogy of the Holy War, it’s revealed that some of the Dark Warlords were originally skilled warriors or clergy and that is why they possess holy blood. 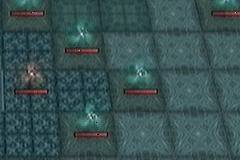 Blazing Sword reuses this idea on a large scale with the empty Morphs created by Nergal. In the final chapter, there’s even a direct parallel with the Dark Warlords in the form of the Morphs based on fallen Black Fang members such as Lloyd and Linus. The Sacred Stones carries on this theme with Monica (Orson’s wife), Vigarde and Morva, who were all resurrected by Lyon. Radiant Dawn also touches on this theme with the revived Order soldiers in Part 4 Endgame. Finally, we come to Awakening, which introduces the Risen, who are again mindless zombies; the game suggests the Risen are fallen soldiers from the Grima-invaded timeline. Curiously, one of the final chapters has Aversa fighting together with the 12 Deadlords (Dark Warlords), who carry holy weapons from Jugdral. The origin of these particular enemies is unclear, although the DLC episode “Infinite Regalia” features not just 12, but 36 Deadlords and suggests they’re fallen heroes from other worlds (which includes a failed Marth and Chrom’s company who lost to Grima). A divine being that is mentioned in a number of games. In Dark Dragon and Sword of Light, Mystery of the Emblem (and the remakes), Naga was the king of the Divine Dragons and the guardian deity worshipped by the Archaneans. In the past, Naga protected mankind from the feral Earth Dragons; before her death, she created the Falchion and Fire Emblem from her fangs. Tiki, another Divine Dragon, is her daughter. It should be noted that Naga’s gender is never directly mentioned in these games (“king” is gender-neutral in Japanese); early texts refer to Naga as male, but recently we believe it’s more likely that Naga is female. In Genealogy of the Holy War and Thracia 776, Naga was one of the twelve dragons that blood-bonded with the Twelve Crusaders during the Miracle of Darna. According to legend, Naga took on the guise of a young maiden. The Naga holy blood was carried by Saint Heim—the ancestor of Grandbell’s King Azmure and Prince Kurth—and Naga is also the name of Grandbell’s holy light magic. In the developer’s notes, it’s revealed that Naga was the Divine Dragon King from Archanea, who traveled to Jugdral to stop the rogue Earth Dragon Loputousu’s intentions. In Path of Radiance and Radiant Dawn, Naga isn’t ever mentioned. However the prince of Goldoa, Kurthnaga’s name is formed from the two words “Kurth” and “Naga”, which appears to be a blatant throwback to Genealogy of the Holy War. Shadow Dragon introduced a new character named Nagi—a Manakete that looks very similar to an older Tiki. She resides in a tower from another world and gives Marth a weaker version of the Falchion. Before you wonder what Nagi’s relevance is, her ending title during the game’s Epilogue is “Divine Dragon King’s Avatar”, while the event where she appears is named “Revived Divine Dragon King” (in the Japanese version). Furthermore, her internal (in-game) name is NAGA. In other words, Nagi is Naga (or perhaps the successor to Naga). 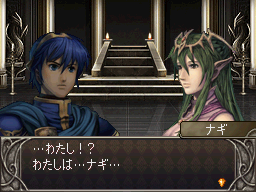 Curiously, Nagi appears again in Heroes of Light and Shadow, but Marth doesn’t recognise her, implying that her recruitment in Shadow Dragon was not canon. Naga appears again in the backstory of Awakening, as the kind Divine Dragon who helped mankind defeat the Fell Dragon. Thousands of years ago, Naga blood-bonded with the first Exalt of Ylisse and now the Mark of the Exalt (Mark of Naga in the Japanese version) appears on various Ylissean royal family members. Near the very end of the game, Naga appears before Chrom and company, after being summoned by the Awakening ritual. This is also the first time Naga physically appears as a character—she appears in the form of a woman and bears a striking resemblance to Nagi. Additionally, the Knights of Iris book explicitly suggests that Naga in Awakening is the spirit of the Divine Dragon King of Archanea and that Grima is an Earth Dragon descendant. However, before you think it’s all safe in the bag, in the DLC episode Future of Despair 3 (which takes place in an alternate timeline), Naga’s power is exhausted and thus cannot help the children defeat Grima. Instead, Tiki—who was killed by Grima earlier on in this timeline—becomes the next Naga, in place of the original Naga. When the children initiate the Awakening ritual, Tiki grants them her power to defeat Grima. This implies that Naga doesn’t always have to be the same person. A powerful sword that appears in a couple of games. In Dark Dragon and Sword of Light, Mystery of the Emblem and the remakes, the divine sword Falchion was created from the fang of Naga, king of the Divine Dragons. Afterwards it was stolen from its resting place, but eventually found its way into the hero Anri’s hands. The Falchion was used by him and, his descendant, Marth to slay the Shadow Dragon, Medeus. In Gaiden, Mila, the Earth Goddess, was sealed within a Falchion. 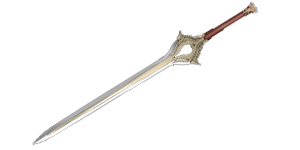 Alm obtains this Falchion by passing a trial in Doma’s Temple, and uses it to defeat the Dark God, Doma. In Genealogy of the Holy War, the Tyrfing, used by Sigurd and Celice, has a very similar design to the Falchion. The Falchion reappears in Awakening, as the national treasure of Ylisse and Chrom’s personal weapon. Long ago, the first Exalt defeated and sealed away the Fell Dragon using the Falchion. Afterwards, the Falchion’s power was sealed to prevent its power from being misused. Early in the game, Chrom encounters a masked swordsman named Marth who carries another Falchion, even though there’s supposed to be one Falchion in existence. Towards the end of the game, Naga dispels the seal on Chrom’s Falchion and it becomes the Divine Falchion blade once more.